Kuwentong Kabayanihan Contest ~ Philippine Freebies, Promos, Contests and MORE! The Kabayanihan Foundation is dedicated to developing the lives of Filipinos through fundraising and volunteer efforts centered on education and community development. As a way of promoting patriotic citizenship, they came up with the Kuwentong Kabayanihan contest emphasizing the CSC's R.A.C.E. to serve - towards a Responsive, Accessible, Courteous and Effective Public Service. With the theme “Every Filipino is a hero. 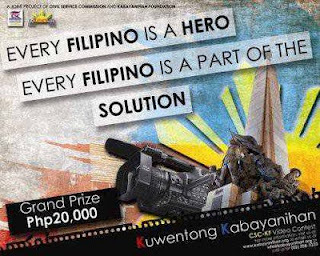 Every Filipino is part of the solution”, filmmakers are encouraged to join and express their acts of heroism through a 30-40 second video. No fee is required to join. Winners will take home P20,000, P10,000 and P7,000 respectively. There will also be special awards for other contestants. Theme: “Every Filipino is a hero. Every Filipino is part of the solution.” A video that will move ordinary Filipinos to act on the most pressing concerns in their immediate fields/circles/areas of influence. In addition, will stir every Filipino to do something concrete for the country. There is no limit as to the style of the video. It may be an animation, documentary or commercial video, among others. After the deadline of submission, finalists will be contacted to present a clean DVD copy of their video entries. The videos are required to be in .avi, .mpeg, .mp4 or other formats supported by both YouTube and Facebook uploads. DVD entries must be must be properly labeled with the video title, name(s) of the sender, email address(es), and contact details and shall be mailed to "Kabayanihan Foundation Unit 2B Dyna Cool Building, 136 Katipunan Avenue, St. Ignatius, 1110 Quezon City"